If you have been using Spire to process payroll, you will need to complete a few important processes BEFORE running your first payroll in 2016. Perform the following procedures AFTER your last pay in 2015 and BEFORE your first pay in 2016. You should be running Spire 1.2.12 or above. A ‘Payroll Year End’ is necessary to set the payroll totals for the year; this information is what is shown on the Earnings tab for each employee, and is used to print T4’s. . The process basically adds all the pay amounts from the year and puts the total into annual total fields. From the top menu, select Payroll => Payroll Year End. Once you do the Payroll Year End, select any employee and go to their Earnings tab. You should see that the totals in This Year are 0, and Last Year reflects their last year’s pay. There are both Federal; and Provincial Tax Credit amounts in the Amounts tab for each employee. For 2016, the Federal Tax Credit is $11,474 while the Ontario Claim is $10,011 for employees with no special deductions such as for tuition or disability. You can download the federal and provincial TD1 forms here if required. You can update the Federal amounts automatically by using the Update TD1 button on the Employees tab. 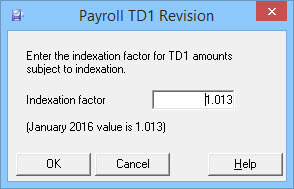 For 2016, the Federal Indexation Factor is 1.013. Select all the employees and then click on the TD1 button. IF the 2015 amounts were correct, the new Federal amounts will be correct. Otherwise, you will have to amend the amounts manually. When processing payroll, Spire uses the Pay Schedule to assign the Pay Period based on the time card date. From the top menu, select Payroll => Payroll Schedule. If the option is grayed out, go to Edit => User Settings; select the User, Payroll, and check “Manage Payroll Schedule”. Select the frequency that employees are paid. The table will autocomplete with pay dates beginning January 1, 2016. 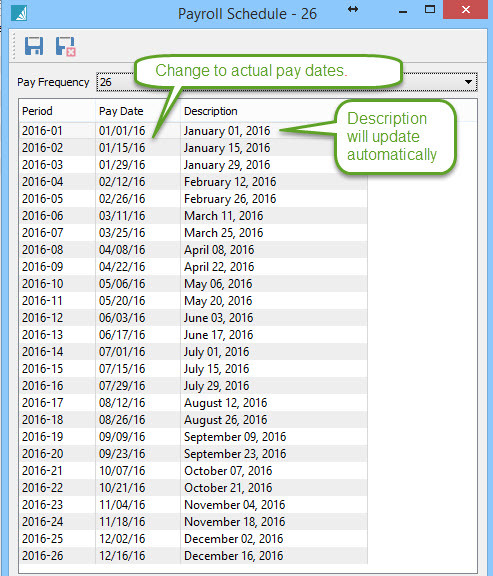 Edit the dates to reflect your actual pay dates. The Description will update automatically. By default, the description is not printed on the paycheques but it can be added if desired when customizing the payroll cheque. Some companies detail the exact days for which employees are being paid. For example, it might read ‘Dec 14 – 25, 2015’ for the January 1, 2016 pay. Once you have completed the above 3 steps, you are ready to begin processing 2016 payroll in Spire. This entry was posted in Accounting, Spire and tagged 2016, Payroll, Payroll Year End, Spire, TD1 by InSpired Consulting Services. Bookmark the permalink.